On Pasture turned 4 on March 21, and my how it’s grown! There are almost 1500 articles in the archives and around 90,000 readers stop by every month. On Pasture will keep on growing thanks to a Conservation Innovation Grant from the Natural Resources Conservation Service BUT only if you help us meet the annual minimum match of $15,000. So celebrate On Pasture’s birthday by making sure there are many more to come. And check out the Party Favors too! $5/month – Set it and forget it! $24 for the Birthday Year. That’s just 48¢ per week of On Pasture. $12 for the Birthday Year. If $24 is really too much, we get it. Can you do $12? And if you can’t do $12, can you send us a note to tell us you are there, you are reading? OR…Choose Your Own Level of Support! Click to download your excerpt of the cookbook. Shannon Hayes’ book is the best selling grassfed meat cookbook for a good reason. It’s because she know the difference between grassfed and conventional meats, and what it takes to make the most of them. In this excerpt from the 10th anniversary expanded edition of “The Grassfed Gourmet Cookbook” you’ll get a “taste” (get it?) of why grassfed farmers love this book and why they keep copies to sell to their customers. 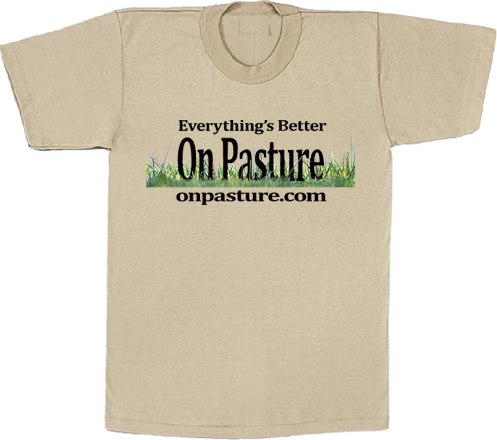 Be an On Pasture Sponsor! Your grazing group or organization can underwrite On Pasture at what ever level works best for you. Depending on your level of support, we can work with you to provide articles for your newsletters, bumper stickers for the whole group, and a shout-out on our Underwriters page. Contact Rachel for more information on getting started.